Ligaments are strong bands of tissue that connect bones to bones. In the knee there are four major ligaments. 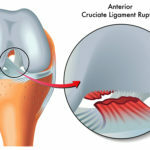 The ACL is one of two ligaments that criss-cross in the middle of the knee to connect the thigh bone (femur) to the leg bone (tibia). The other one is called the posterior cruciate ligament (PCL). The ACL and PCL are responsible for stability in the knee, especially with forward and backward shifting. The ACL is the most commonly injured of the two cruciate ligaments and is frequently associated with sports such as soccer, basketball, football, skiing, or gymnastics. Motions that result in ACL injury often include: a sudden stop, pivoting on the knee, suddenly slowing down and changing direction, landing a jump awkwardly, or a direct blow to the knee. Those who experience an ACL tear often describe a “pop” in the knee, followed by swelling, pain, decreased range of motion, and progressive difficulty in bearing weight. They often state that they “don’t trust the knee” or that “it feels like it might give out”. It is also possible to have an ACL sprain without fully tearing the ligament. Initial treatment is often a brief period of immobilization, partial weight bearing with crutches, and therapy (at home or with a physical therapist). Definitive imaging with an MRI is often performed to confirm the diagnosis and assess for any additional injuries such as meniscus tears or bone bruises. Surgical treatment may be indicated depending on baseline activity level and response to conservative treatment.